The HydroWhirl Poseidon range of PTFE tank cleaners available from BETE Ltd has recently been enhanced with addition of new models and flow rates as well as improvements in the overall design. The PTFE material of construction ensures that the design is not only hygienic but also highly resistant to corrosive chemicals, so it can handle powerful caustics or the cleaning of acidic environments.However, the biggest advantage of the reengineered PTFE design is the slower rotation speed. As the head turns more slowly than metal equivalents the dwell time for the cleaning spray is higher and results in a concentrated spray action against internal surfaces of tanks and vessels for effective removal of scum rings and tougher residues. 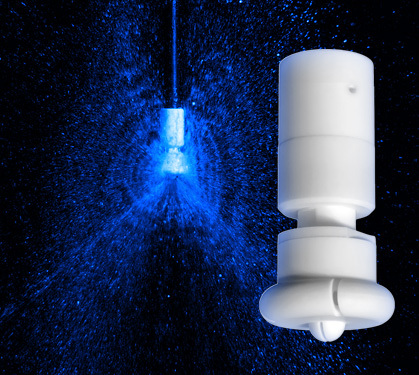 This also means that the Poseidon delivers more cleaning power per litre of fluid than 316 stainless equivalents making it the ultimate tank cleaner for mid-sized, hygienic tanks.The HydroWhirl PTFE nozzle provides complete 360º omni-directional coverage and is also designed for quick and easy disassembly, inspection and reassembly using basic hand tools, so downtime is minimised. These new flow rates and slower rotation speeds means the HydroWhirl Poseidon range is particularly effective for cleaning tanks between 0.5 and 7 meters in diameter. It is ideal for food & beverage applications as well as for corrosive chemical processing tanks.